Restaurants : Magnolia's Veranda, Hugo's Cellar, Chicago Brew Pub, and a Food court. Standard room amenities : Air conditioning, alarm clock, TV, hair dryer, in-room safe, iron and ironing board, radio. Hotel amenities : Budget -Rent-a-Car, currency exchange, laundry service, same day dry cleaning, maid service, safety deposit box, 24-hour room service. 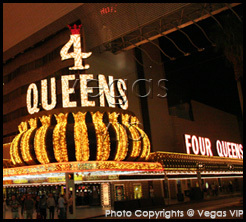 The most dazzling lights in the heart of downtown Las Vegas shine at the Four Queens. Their brilliance reflects the dynamic fun and excitement that goes on 24-hours a day at the hotel. The casino floor is alive and bustling with excitement. And, boasting several styles of poker at the tables, from Caribbean Stud to Let It Ride, there is no shortage of vigorous game play. The dining is among downtown's most celebrated, with the culinary delights of Hugo's Cellar and several other gourmet hotspots. 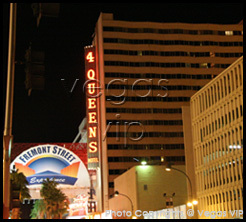 At the Four Queens, twin 19-story towers boast 690 rooms including jacuzzi-suites. Also, valet parking, 24-hour bell service and same-day dry cleaning and laundry services are available.